The picture to my left, probably needs a bit of explanation. 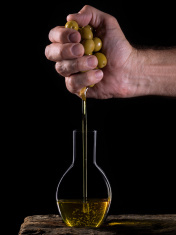 I’m sure you can tell that the hand is squeezing olive oil into a bottle or jar of some sort, but why that is important may escape us, here in the United States. I thought olive oil was some sort of exotic thing from a distant land, while I was growing up. When you throw in the explanatory phrase of “Extra Virgin”, it is enough to make any American teen giggle. In all honesty my family was not all that cultured outside of the traditional Italian and Croatian dishes made with consistency in our home, and for me cooking oil was not supposed to be exotic, beyond the names of Wesson, Crisco or Mazzola. Eventually I found that cooking oil came from vegetables, but did not care from which ones, so long as my fried chicken was on time. AMEN!!! As I grew toward adulthood, my mother became more aware of what was good and bad for us, due to some of those middle aged and expected diagnosis, such as high blood pressure and high cholesterol. At the onset of these potential threats mom began to use olive oil more, and its mystery faded, but I had no idea the importance the olive and its life giving oil had in the biblical culture. I would literally have to take several writings just to scratch the surface of the biblical symbolism of the olive tree, its fruit and its oil, as contained in the word of God. Sufficient for this writing we will speak only of its practical necessity and method of extraction. This all in an attempt to follow up on last weeks writing on the highest calling and most evident witness of Jesus in our suffering. As we begin, it is important to understand that the olive and its precious oil was one of the ancient Israelite’s most needed essentials in life. 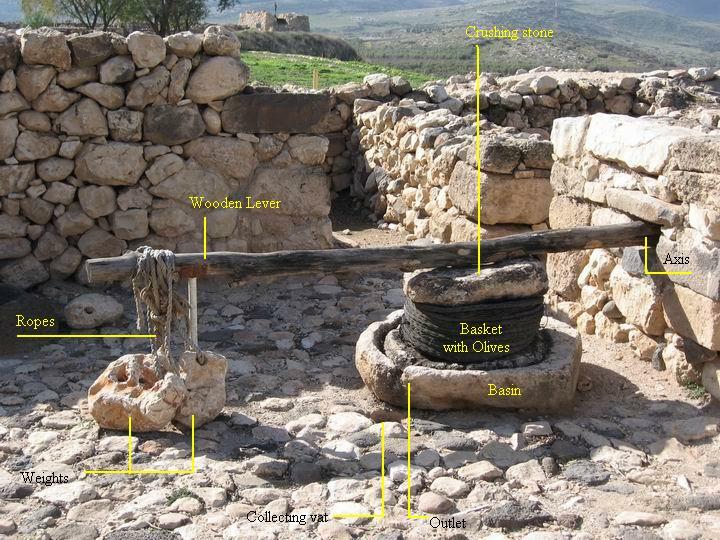 They used the olive as food and its oil to cook with, to make soap, to preserve other foods, for medicinal purposes, in making soap, as moisturizing lotions in the arid climate and in the preservation of bodies for burial. The olive and it’s oil was essential to life in almost all areas and how it was extracted in normal settings is to say the least interesting. On the right you can see a press that would have been present in many a home or village in biblical times. The olives would be placed in the basket with a weighted lever on top the basket. As the lever was pushed down, the life giving oil would be squeezed from the olives. This process was not a short endeavor in time, but one that took a few days, with heavier pressure being applied periodically to extract every once of useful oil. The olives had no way of falling out of the woven basket, being squeezed until mere shriveled husks. 2 Corinthians 4:7-11 But we have this treasure in earthen vessels, that the excellence of the power may be of God and not of us. We are hard pressed on every side, yet not crushed; we are perplexed, but not in despair; persecuted, but not forsaken; struck down, but not destroyed— always carrying about in the body the dying of the Lord Jesus, that the life of Jesus also may be manifested in our body. For we who live are always delivered to death for Jesus’ sake, that the life of Jesus also may be manifested in our mortal flesh. So then death is working in us, but life in you. Considering the process needed to extract oil from the olives, the above passage becomes very clear. For those who have been redeemed in Christ, like the olives, we are to be pressed, consumed and spent in the service of Christ, based on our selfless love for Him. It does not matter who you are my dear fellow follower of Jesus; in this life you will have tribulation (John 16:33) and since they hated Jesus and pursued him unto death, they will hate you and pursue you to stop your faith and love for Jesus. They will follow this pressing until they marginalize you, until you recant your faith or they lock you up or kill you (John 15:18). There simply is no alternative in this world which is empowered by the prince of this world, who is Satan. Yes, his squatters reign is fast ending, but until that time Christ’s own will be in hard-pressed, perplexing (having no escape), persecuted, and struck down tribulation. Yet we must find purpose and rejoicing in having the life squeezed out of us, for its not our life that comes oozing from every molecule of our being at that point, but the resurrection Life of Jesus our Lord. Hallelujah!!! As the word of God declares above, we are delivered to death. This means we are called by Christ to join him in circumstances that could bring our death, hurt or harm. This is so that in our inability and weakness to survive or get through or even behave in Christ’s love, He would gush forth in that pressing, perplexing, persecution barrage of blows. This is why those who follow Christ find themselves in impossibility after impossibility. As we submit to God in these times, Jesus literally lives through our broken bodies, and taxed emotions and irritated spirits to testify of Himself to those who need life. Paul, through whom the Holy Spirit wrote this passage, lived this every day. Paul was beaten with rods until his body and flesh quivered and ran red with blood, but in the midst Jesus was manifested in his mortal flesh and God’s love came through. He was stoned to death for preaching Christ our Lord, where his human frame lay oozing life from a cracked skull no doubt. Yet with great power Jesus animated his dying body with life and he with great boldness returned to the city, as soon as he was on his feet to preach Christ again. He was mocked and ignored by those who had charge over him, when God warned him about a storm that would possibly sink the ship and cost lives. In the midst of the storm he led them all confidently and all survived, as Jesus lived His life through Paul in authority. This man, whom was hated and pursued by his own Jewish brethren, wrote as Jesus life poured through Him, that if it were possible He would become accursed for his brethren that they might be saved. Jesus in His love already had done that, Paul knew it, but was expressing the resurrection love of Jesus. Paul reminds us that, yes having the life of Jesus squeezed from our mortal bodies will leave marks, cause pain, tax our emotions, wear our will down and seem to muddy our spirits with bitterness. Paul also reminds us that in that dry, shriveled and exhausted state, just like the completely pressed olive, that Jesus fills us back up again to vibrancy, with His life. 2 Corinthians 12:9-10 And He said to me, “My grace is sufficient for you, for My strength is made perfect in weakness.” Therefore most gladly I will rather boast in my infirmities, that the power of Christ may rest upon me. Therefore I take pleasure in infirmities, in reproaches, in needs, in persecutions, in distresses, for Christ’s sake. For when I am weak, then I am strong. Here we find Paul declaring, “Since I know my suffering is for the purpose of Jesus being seen as God and Savior in my body, I rejoice”. In Paul’s rejoicing Christ rested (tents) upon him, for the purpose of filling him up again. Once more this process is our highest calling and most evident witness. So here is the challenge… Are you willing to deny yourself daily, die to yourself daily and if it brings Him glory, suffer in the hard-pressing, that His life can be squeezed out of you? Most I would assume would say yes, but with some reluctance. I suppose that is better than saying “No way man”, but let me express an admonition. Reluctant faith is inherent in all of us at some point, but for it to be allowed to remain, will only lead to denial. Paul declared he would rejoice in the suffering. We may ask why? He rejoiced because his love for Jesus the Messiah was so great he wanted to suffer, as long as it reveled Jesus. To Paul there was no greater way than to abandon himself to the One who abandoned Himself, for Paul’s sake. To Paul there was no greater love for Jesus, than to die to himself (even literally die), so another would find life in Christ. It is that love which makes having the life squeezed out of you the most worth while of endeavors. This entry was posted in Christian life, Christian suffering, dark night of the soul, despair, enduring faith, persecution, power of God, spiritual warfare, Truth, Word of God. Bookmark the permalink. 2 Responses to Having the Life Squeezed Out of You. I have often asked myself the question that you just asked and i have answered YES. I even asked the Lord that i would die serving Him. I thank you for your blog pastor Mike the Lord truley speaks through you.